ag·gre·gate 1. verb, to collect or gather into a sum or whole. 2. noun, a dense cluster of soil particles which vary in size and type 3. noun, the projects accumulating at my desk. You know you're a tad knitting obsessed when you see the Star Trek movie and pay more attention to the construction of Scotty's hat than you do to the exposition. This is the pattern for a hat based on Scotty's, knit flat in two connected panels of garter stitch going different directions. It takes a good deal of yarn, a bit of time, and quite a few picked up stitches, but in the end you'll have a delightfully squishy, floppy hat like Mr. Scott's. The pattern is pretty easy but incorporates a couple of non-beginner level techniques (short rows, picking up stitches), so I've included links to KnittingHelp.com tutorials. This pattern is free and is intended for personal, non-profit use. The brilliant hat designer Woolly Wormhead has also come up with a pattern called Trekking, based on Scotty's hat in the movie but knit in the round. It's available here as a free Ravelry download. The following pattern has two options: the original two-panel hat or a more accurate four-panel hat. Big, big thanks to Beeca for proofing the pattern and the wonderful folks on Ravelry for their interest and encouragement! Gauge: about 16 stitches and 30 rows = 4" in garter stitch. If in doubt, go tighter - the garter stitch is very stretchy. Potential mods: This pattern should be pretty easy to mod. To make a longer hat, just knit the first part of section A for longer before starting decreases (this won't affect anything else in the pattern except your yarn usage). To make section B narrower, start and end the short rows at a smaller number (i.e. start short rows when you're 20 st from the end of the row instead of 22 and end them at 20 st from the end of the row as well). pick up stitches - um, see this video. Or the Yarn Harlot's wonderful tutorial (with photos) here. And now, on to the pattern! Scotty's Hat (four-panel version) is available here. There are two sections to this hat, A and B.
K to end of row. Repeat this row until you have 16 inches of fabric. Now it's time to narrow your fabric toward the tip of your hat! K1, k2tog, k to 3 st from end, k2tog, k1. K to end of row. Repeat these last two rows 15 times. This will decrease your stitches by half, leaving you with 30 st on the needles. Scotty's hat comes to sort of a rounded point, so for this last part of the tip, the decreases are more frequent. K1, k2tog, k to 3 st from end, k2tog, k1. Repeat this row 13 times, until you've got 4 stitches left on the needles. BO all stitches. Choose your favorite side of section A and flip it so that's facing you, with the brim pointing toward you. Pick up all stitches along the left side of section A (one stitch per two rows - the exact number will vary based on your row gauge), starting at the brim of the hat and working toward the tip. K one row, starting from the tip. Now it's time to shape this wedge of fabric using short rows. Whoo, short rows! K to 22 st from end (tip), w&t. K to 20 st from end (tip), w&t. K to 18 st from end (tip), w&t. K to 16 st from end (tip), w&t. K to 14 st from end (tip), w&t. K to 12 st from end (tip), w&t. K to 10 st from end (tip), w&t. K to 8 st from end (tip), w&t. K to 6 st from end (tip), w&t. K to 4 st from end (tip), w&t. K to 2 st from end (tip), w&t. Half the wedge is knitted now, so it's time to start shaping the other side of it. Seaming is a two-part process, because you'll seam the first 6" inside out. This way, you can wear your hat with anywhere from 3"-6" of the brim folded over without having the underside of a seam showing. First, line up the edges of the brim so the left edge of section B and the right edge of section A are aligned. Pin the edges together. 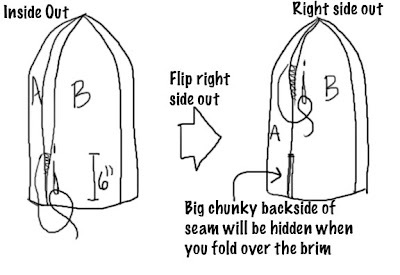 Flip the hat inside out and seam the first 6" of the brim using mattress stitch. Second, flip the hat right-side out and continue seaming to the tip of the hat. If you find a small gap at the tip of the hat, draw the tail of your yarn through the stitches around the gap and pull it closed. Weave in all ends. Block if you like. Wear your Scotty hat while solving complex mathematical quandaries, beaming beagles through space-time, and eating sandwiches. Thank you for designing the pattern! It looks great! You are the AWESOME! Thank you. Love the hat. Thanks for the pattern. I can't wait to knit it! Joyful Darkness: There was a delay due to crap weather (93-degree heat + wool = not so much knitting), but I'm on it now. Check back around...Sunday? I just saw the movie tonight and I'm thrilled that my knitting friends (read: freaks) have not let me down and already have a pattern... I also would rather a 4 panel hat, as I think it would be a better looking hat. I'll wait. Love the pattern! AND the hat! too fun! Glad to see I wasn't the only one trying to figure out how that hat was constructed instead of listening to the dialogue! Also glad you were more sucessful than I was, AND are willing to share! Thanks! You are definitely an engineer! Yay! My hat is complete! I'm a writer, knitter, reader, geek, painter, tech support worker, and MFA student in creative writing. Projects collect around me. Scotty's hat is mine now!